Members of Mexico's drug cartels are starting to harness the power of the internet, using it to run positive PR campaigns, post selfies with their pistols, and hunt down targets by tracking their movements on social media. Members of Mexico's drug cartels are really starting to harness the power of the internet, using it to run positive PR campaigns, post selfies with their pistols, and hunt down targets by tracking their movements on social media. Antoine Nouvet from the SecDev Foundation, a Canadian research organization, has been working with drug policy think-tank the Igarapé Institute on a project called the Open Empowerment Initiative. The project looks into "how cyberspace is empowering individuals and rewiring relations in Latin America" and has uncovered a wealth of information about how cartels are using the internet to their own nefarious ends. Some gold weapons posted on a cartel member's Facebook page. The first point Antoine touched on was how cartels have utilized cyberspace in much the same way as a TV company's PR department might: "They advertise their activities, they conduct public relations initiatives, and they have basically turned themselves into their own media company," he explained. "Colombia's cartel groups or drug traffickers in Myanmar in the 1990s were very sophisticated at public relations, but they didn't have this massive broadcasting platform." Not all cartels want to be seen as the bad guys these days. After Hurricane Ingrid tore across northeastern Mexico in September, the Gulf Cartel uploaded a video to YouTube that showed them distributing aid to those in need. It quickly went viral and has racked up nearly half a million views. The video-sharing site has also been used as a platform for cartel announcements that, for obvious reasons, aren't usually broadcast by mainstream media. For example, a speech by a leader of the Knights Templar Cartel—a guy known as "La Tuta"—has had over 900,000 views, 60 times the amount of hits received by the Mexican president's September 2013 State of the Union Address (which is dragging its feet at around the 15,000 mark). The Knights Templar (or "Caballeros Templarios," in Spanish) are particularly seasoned when it comes to social media. The group used to run a Facebook page under the immediately transparent pretense of being a "small business," which gathered over 10,000 Likes and regular messages of support until it was shut down earlier this year. Of course, there's another way of garnering attention online when your group page gets closed by the mods: incessantly posting selfies of yourself with guns. Antoine pointed me in the direction of a guy calling himself "Broly," who lists his employment history as Knights Templar and has posted photos of his high performance 4x4, his gang of weapon-toting colleagues, and many, many more that are just him pouting and holding firearms. 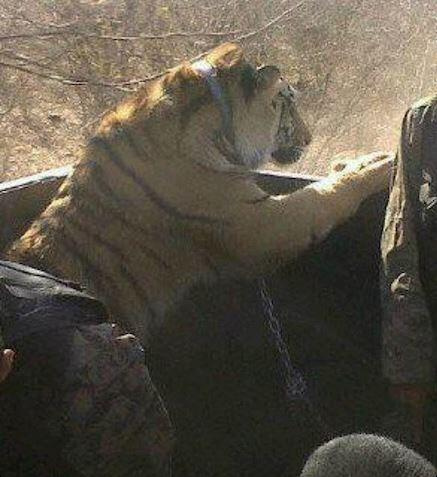 Other cartel profile highlights include a Twitter account of a prominent member of an "enforcer gang," which contains photos of his gold-plated machine guns; a profile purporting to represent the Sinaloa cartel with pictures of what looks like a pet tiger; and an Instagram photo of a cartel member holding an AK-47 out the window of a sports car. All of these cartel profiles are public—something that must be starting to get slightly humiliating for the law enforcement agencies pumping millions of dollars into catching them. Cartels also have analysts working for them, monitoring social media "to find out what Mexicans are saying and keeping an eye on the movement of troops in and out of a city," according to Antoine. Doing so means the bosses can direct their own forces appropriately without picking up any unwanted attention on the ground. Cartels are also using encryption techniques like Onion routing to stay one step ahead of the law. "They are aware of the need to cover their tracks in cyberspace," Antoine said. It's important to note that the cartels' application of this kind of approach, while relatively new, is far from crude. In May of this year, one half of the duo behind Blog del Narco—the most read and influential blog on Mexico's drug war—disappeared. His partner, who goes under the pseudonym "Lucy," told the Guardian he had called her phone, before saying "run" and hanging up immediately. The pair had agreed to use "run" as a codeword for fleeing the country when things got really dangerous, but it's unknown whether Lucy's partner ever made it out as he hasn't been heard from since. If the cartels did get to him before he made it across the border, they wouldn't have done so easily. "It has been done by advanced means: reverse hacking and finding out the identity of the people who are behind what are often anonymous posts online," Antoine explained. "It takes some technological savvy to find out who's behind them and then to track them down and kill them in real space." It's similar technology that would account for the rise of a whole new kind of crime: "express kidnappings," which are typically planned and carried out in a number of hours rather than days and usually don't involve anyone being taken hostage at all. A car filled with weed. According to Antoine, "New technologies such as smart-phones are leaving people very vulnerable to kidnappings." After hackers have compromised a device belonging to a target, the target receives a call telling them that their relative has been taken hostage—a claim legitimized with location data and other information taken from the phone. They're also told that they're being watched, with the criminals tracking their whereabouts through GPS. The victim is then told that they must not hang up, before being directed to an ATM and getting in a taxi to head to a meeting point where they've been told to hand over the money. Once they arrive, the criminals can simply take what they want and drive away, all without leaving the comfort of their keyboard. Of course, this technology could also be used by cartels to very easily trace an assassination target, or even for the hitman to take the lazy approach and lure the mark out to wherever they wanted, before putting a bullet between their eyes and driving off without undertaking any of the traditional legwork. Whatever the outcome, it's achievable with very few resources and was impossible before the increase of cheap, readily available smart phones. A photo of a cartel member's suped-up 4x4. However, with the cartels becoming more reliant on the internet, it could also easily become an Achilles' heel. "At the moment it gives them an edge," Antoine told me, "but it could backfire very quickly." This vulnerability was already demonstrated when Anonymous conducted attacks on the Zetas cartel in 2011, accessing their private data and threatening to reveal members' names. However, the cartel quickly retaliated by "hiring" its own security specialists, and Anonymous backed down after one of its members was allegedly abducted. Clearly, cartels aren't packing their members off to computer science evening classes at the local community college, and it's likely the more specialized experts have been kidnapped. "They may be engaging young computer scientists in Mexico and giving them a good salary, but if they still require a skill, they just kidnap someone who has it," Antoine explained. "As of 2012, we had at least 36 cases of engineers who were snatched by the cartels, including an IBM employee, never to be seen again." But even if they're kidnapping the best of Mexico's technological talent, this greater dependence on the internet could be the cartels' eventual downfall. "Technology that benefits the cartels suddenly turns out to be one of their key vulnerabilities," said Antoine. "And that could be the case in Mexico if the government adopts better skills and laws to counter them in cyberspace." Is the Los Zetas Leader's Capture Really Such a Good Thing?